The Egg Chaser (エッグチェイサー Eggucheisā), is the fifth boss of Sonic Advance 3, and is fought in Twinkle Snow's boss Act. One of the hardest bosses in Sonic Advance 3 (and, indeed, one of the hardest bosses throughout the entire Sonic series), this battle sees Dr. Eggman chasing the player up a giant igloo, populated by unsteady platforms that will fall just after landing on them. As the battle moves up, this creates a bottomless pit, which is the biggest hazard of this fight. The only way to attack Eggman is to get the platforms to land on top of him, which is hard as he constantly moves back and forth. Occasionally, he'll flip his machine over and launch a giant mace in the player's general direction, which also makes him invulnerable until he flips back. Gemerl is situated just under the mace as Eggman flips over. The best strategy is to worry about moving up without getting hit, as hitting Eggman will come easily; it is worth noting that if you get hit, unless you're lucky enough to land on another platform, you will simply die. 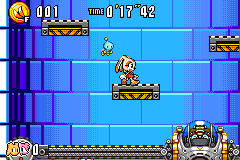 Playing as Tails with either Sonic or Amy as his partner is recommended due to Tails' ability to fly. It takes 8 platforms (6 on Easy) to end the chaotic battle and move on to Cyber Track. This page was last edited on 24 April 2018, at 15:44.